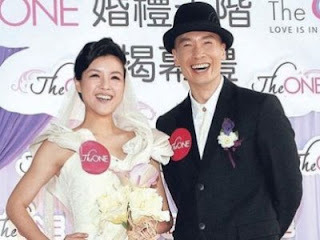 Rumour has it that TVB is interested to broadcast Moses Chan and Aimee Chan's wedding, Asianpopnews reported. The couple, who have been in the spotlight ever since Aimee's sudden withdrawal from her martial arts drama, "Cold Mountain, Hidden Dragon", which triggered rumours of her pregnancy, are speculated to hold their wedding early next year. Sources claimed that not only the actress, who has returned to her family home in Toronto, will be delivering her baby in Canada, both Aimee and Moses will register their marriage and hold a low key wedding attended only by their close friends and family in Australia and Hong Kong after her delivery. However, TVB also wants a slice of the cake, and wishes to broadcast the wedding in a grand fashion through TVB Jade, not unlike their previous broadcast of Eric Tsang's 60th birthday. It was reported that TVB Executive Virginia Lok has been negotiating the plan with Moses and even offered Shaw Studios for the ceremony, although sources claimed that the actor is not too keen with the idea, as the couple preferred a small celebration to maintain their privacy. Moses Chan and Aimee Chan met in 2010 after playing brother and sister in the Jonathan Chik-produced drama, "Master Of Play". Oscar Leung: A wedding broadcast is bad luck!